Agostino de’ Musi Veneziano was born around 1490 in Venice where he was trained as an artist and engraver. With whom he studied is not known, but his early prints reflect the study of the giorgionesque works of Giulio Campagnola and Jacopo de’Barbiere. Of special interest are his copies of Dürer’s prints of which the Last Supper is dated 1514. Soon thereafter he may have gone to Rome where by 1516 he joined the shop of Marcantonio Raimondi. Agostino engraved two designs by Bandinelli, dated 1515, and Sarto’s lost Dead Christ with Angels in 1516 and it has been assumed he did them in Florence during a stay on his way to Rome. 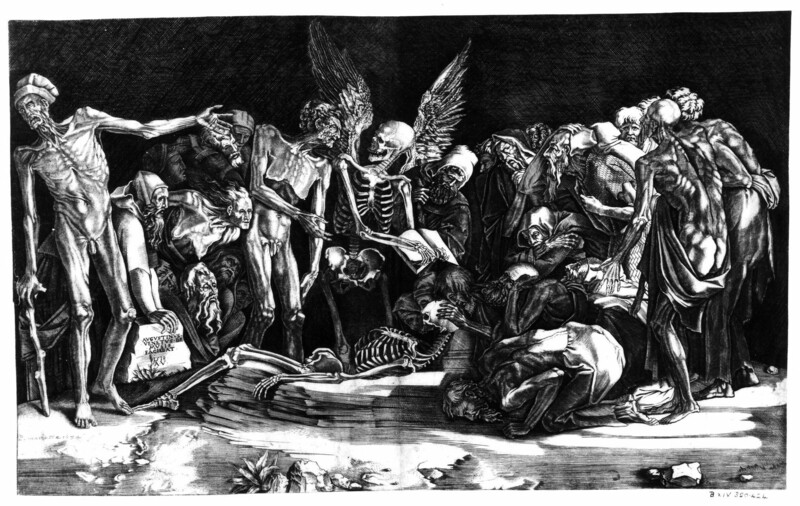 His engraving of Rosso’s large disegno di stampa of 1517, the Disputation of the Angel of Death and the Devil (Fig.D.1a), is dated 1518 (Fig.E.109). Rosso could have met Agostino in Florence at the time that he did the engravings after Bandinelli’s and Sarto’s designs and it is assumed that Rosso’s drawing was made in Florence and Agostino’s engraving after it as well. 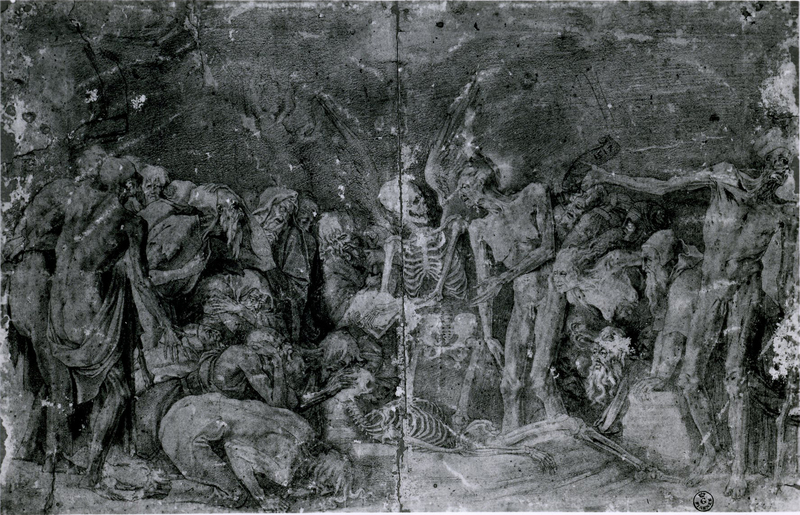 But none of these prints bears the indication of where it was done, and the date of Rosso’s drawing and of Agostino’s print along with the absence of dates for Agostino’s other work does not allow for a secure history of where he would actually have made his Florentine images as apart from where the designs from which he worked were made. There are a variety of details in Agostino’s print of Rosso’s drawing that are additions to the original composition, as for example the plants and rocks in the foreground, the elaboration of the feathers of Death’s wings and the weaved pattern of the garment worn by the old bearded man leaning forward and pushing back his cap in the right half of the engraving. Such elaborations do not exist in the many Roman prints by Caraglio of Rosso’s Roman disegni di stampe. In that later association the draughtsman and the printmaker worked together in the same place. No such close collaboration existed between Rosso and Agostino Veneziano, making it possible that the drawing was taken by Agostino to Rome or sent to him there. It may be said that all the elaborations by Agostino give to the printed image an engraved vitality that Rosso’s red chalk drawing does not intend in his more muted drama. By then Agostino’s print is a demonstration of his own remarkable talent and training as an engraver that distinguishes his work from the different technique and effect of engravings by Marcantonio in whose shop Agostino would here have exerted himself above his early role there as an assistant. Perhaps Rosso knew that these elaborations would be made but if he did not they may be the reason he never worked with Agostino again and in Rome collaborated with Caraglio instead. After the Sack of Rome in May of 1527 Agostino returned to Venice and later visited Mantua and the break up of Marcantonio’s shop, where he worked from models by Giulio Romano, and Florence. Returning to Rome in 1531, he continued to work there until around 1536. He may have died in Rome around 1540. “Agostino Musi o De Musis detto Veneziano,” in Massari, 1989, 39-40, with bibliography.